BONKIN MINE CABIN #11 is a single house at the front of the property. It is only available during certain dates for guests to rent. Cabin #11 has adjoining door to Cabin #12 that can open for a two bedroom two bath suite. Our property includes 12 separate cabins units. Unique blend of old and new celebrating the rich history of the Foresthill divide and Mining History. Downtown location allows guests to be just a short walk from both the Forest House Lodge and the Memorial Hall venues and only a few minute drive from the Monte Verde Estate. Cabin does have a ramp leading up to door, but not ADA certified. Fantastic location for The Canyons Endurance Run or close to the incredible trails FH has to offer. Right in the middle of FH proper and allows to take advantage of the amenities. 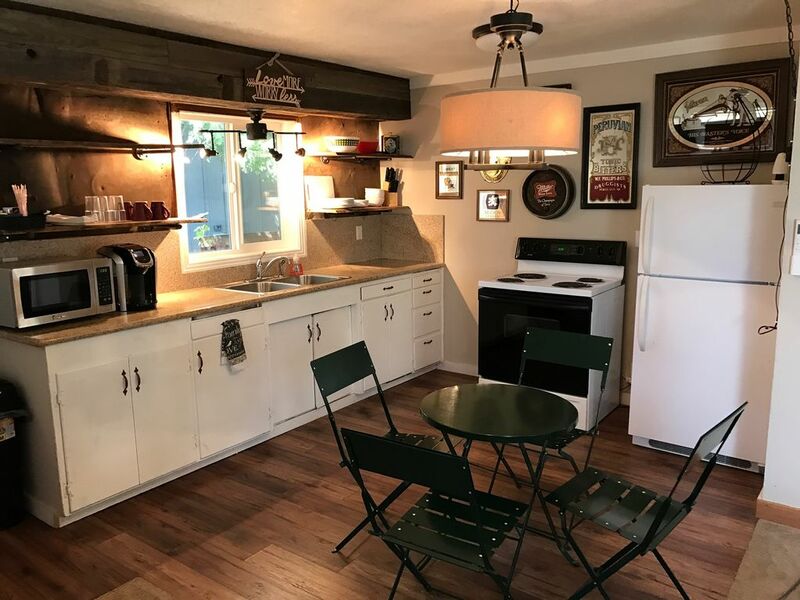 We reserved the Miners Camp Cabins for the weekend of our daughter's wedding in Foresthill, CA. The cabins are quaint, inviting and in general awesome! We along with our guests had a great time, they were clean, the staff was extremely helpful and easy to work with. Overall, l our stay was five-star. Local restaurants, Sugar Pine Pizza and Megas Cafe we'd highly recommend. It's a beautiful area and the Miners Camp Cabins were just perfect. We booked Miner’s Camp months before the cabins were even completed! After we saw the first finished cabin, and the proximity to our wedding venue, we were sold! These cabins are incredibly well done, down to the tiniest detail, and our guests had wonderful things to say about their stay. Because my husband and I had not seen the inside of any of the cabins, the morning after our wedding we wandered by and asked the cleaning crew if we could take a peek inside. They were so welcoming and took us in to see three of the cabins. The whole team went out of their way to make us and our guests completely satisfied with their stay. My wife and I rented cabin 5 and arrived late Monday evening. The cabin was fantastic with all the needed amenities and tons of antiques and nostalgic photos. Unfortunately I came down with a 24 hour flu bug during the middle of the night and I was absolutely miserable. The next morning my Wife called the owner to switch cabins to one with 2 separate beds and not only did he give it to us, he also let us use the kitchen facilities in the other cabin at no extra charge. Although I was not able to do the prospecting I came to do, the Miners Camp made the best of my bad situation and was able to make me feel as comfortable as possible. Thank you and I will be back. REFUND POLICY FOR WEDDING BLOCK BOOKINGS IS 90 DAYS.